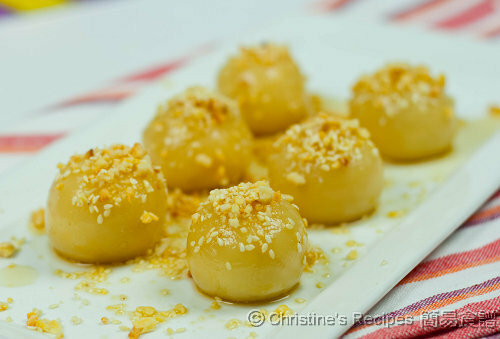 This Glutinous Rice Balls dessert (糖不甩，sounds as “Tong But Luck” in Cantonese) is a common snack in Hong Kong and many Chinese people like to make some for Chinese New Year. Basically, they are sticky rice dumplings, not in syrup, but with crushed peanuts and sesame seeds sprinkled on top, syrup drizzled as much as you like. It's so addictively delicious. Tong But Luck literally means undetachable sugar. I don’t know how and where this name came from. These cute little sticky rice balls are symbolic of completion, happiness and fulfillment and that’s why it is also served in many festive seasons or celebrations. You might think that it’s like “tang yuan” (湯圓). Yes, they are very similar as both of them use the same ingredients, with a slightly difference in cooking and serving way. The glutinous rice balls are soft and chewy in texture, infused with a subtly combined flavours of ginger and cane sugar. The texture of this dish is sophisticated, chewy little balls topped with crunchy crushed peanuts and aromatic sesame seeds. The golden, sparkling colour of these cute balls is very enticing as well. Heat a bit of oil in frypan. Wipe with a kitchen paper as you don’t want the peanuts too oily. Fry peanuts on medium-low heat, turning consistently, until lightly brown evenly. Let cool. Put peanuts in a plastic bag and pound/crush them into smaller pieces with a rolling pin. Fry sesame seeds in frypan until aromatic. Set aside. Place glutinous rice flour in a large bowl. Add warm water bit by bit. Knead flour along the way, and some flour crumbs would be created. Then add a bit of water at room temperature. Continue to knead until the surface is not sticky. Roll out the dough on a clean surface and stretch into a long strip, about 1 inch in thickness. Divide into 6 equal parts. Roll each part into a small ball with your palms. Fill a little saucepan with 1 cup of water and bring it to boil. Add ginger and brown sugar. When it boils again, reduce heat and simmer for 10 minutes to infuse more ginger flavour and thicken the syrup. Heat some water in another saucepan or wok to cook glutinous balls on medium-high heat. Place the balls in boiling water. Immediately stir the water, make sure each ball doesn’t stick to the bottom. Cook until the balls float onto the surface of water. Drain them and transfer to ginger syrup. Simmer for another 10 minutes on low heat. Turn occasionally to make sure all surfaces of balls could absorb syrup well. To serve, spoon out glutinous balls on a platter or divide them in serving bowls. Drizzle more syrup. Sprinkle peanuts and sesame seeds. If you don’t eat peanuts, you can replace it with roasted almond. It tastes very good too. Many people find glutinous balls would turn to be quite mushy if cooked too long in water. The secret to get the best, soft and chewy glutinous balls is to add warm water first, then cold water when kneading your dough. It’s easy and simple. 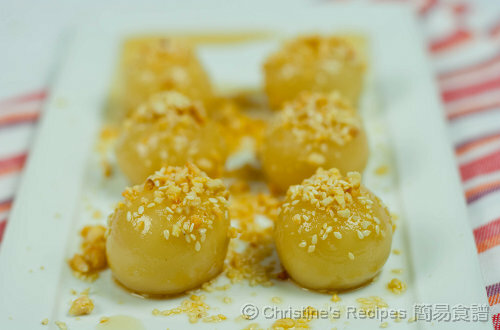 My mum used to cook this dessert on Chinese New Year’s Eve. She also liked to wrap a little piece of brown sugar (片糖) inside each glutinous ball. It makes each ball taste even better. The amount of water in this recipe is just a rough guideline. As you knead your dough, just add water bit by bit as you go. If you feel the dough is too dry, add more water, or vice versa add more flour if you feel it’s too wet, until you get the right consistency you like. so pretty! i like the whole idea with ginger syrup! Mmmmm....very delicious. My favourite to make and eat. I love your ginger syrup. The photo indeed look very tempting! Thank you, only you could make simple things like Tang Yuan look so appetizing!!!! These couldn't be an sweeter! I am so curious to try these little snacks. These yummy morsels are so sticky and sweet. I love them. I've never had this before, would try to make some for Cny dinner! The photos are great! Right, Tong But Luck is popular here in H.K. especially in dessert stores. Pity is that, they don't usually come with a nice presentation as this. These are so cute! I like how you served it with ginger syrup. Delicious!! These are one of my favorites, looking forward to making them. Thanks for posting. 擂沙汤圆 is quite similar to Tong But Luck, but the outside is coated with powdered peanuts. You can't replace with regular. The texture will be totally different. Mine became overly chewy near to hard .. What could I have done wrong? Sorry, not sure what you did wrong as I didn't go into your kitchen when you made this snack. There's one possible cause. If it's not enough water, it'd turn hard. The dough should have a soft feel before boiling. I think you can make these glutinous rice balls well in advance and freeze them. Then you can cook them afterwards. Can I use Sweet rice flour instead of Glutinous Rice Flour? Sweet rice flour and glutinous rice flour is the same thing. They look so good and perfect for the season :-) Happy New Year, Christine.